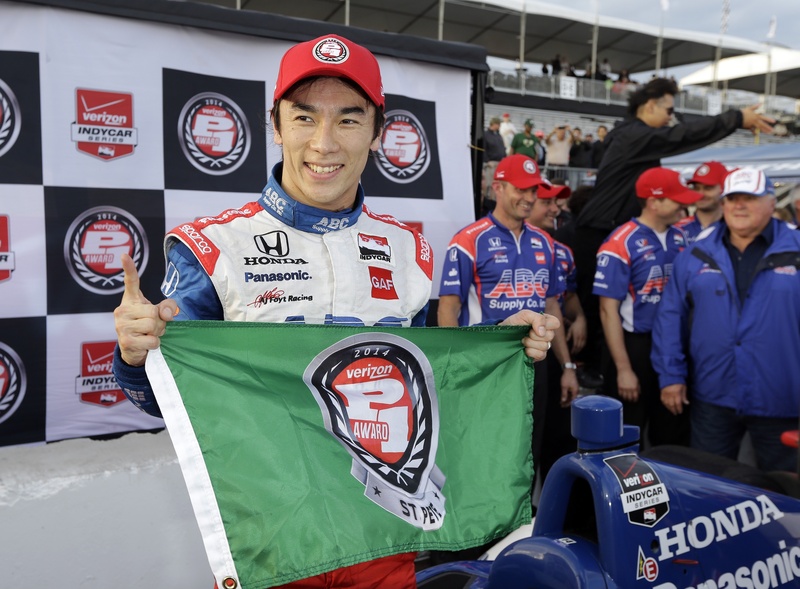 Takuma Sato won the pole at St. Petersburg, Fla., for today’s season-opening IndyCar Series race. Sato circled the street course in 1 minute, 0.01 seconds in Saturday’s rain-delayed qualifying session to put his A.J. Foyt Racing entry out front. It was a stellar debut for Honda and its new twin turbo engine. Tony Kanaan qualified second, 0.2951 seconds behind the Japanese driver. Kanaan will be making his debut today for Target/Chip Ganassi Racing. Ryan Hunter-Reay was third and followed by Will Power, who had won the pole the last four consecutive years. Defending IndyCar Series champion Scott Dixon was fifth and Marco Andretti rounded out the Fast Six. The NASCAR Truck Series race at Martinsville (Va.) Speedway was rained out and will be made up as part of a rare doubleheader today. The Sprint Cup race will start at 10:13 a.m. (PDT), and track officials aim to start the nightcap as quickly as possible afterward – hopefully by 2:30 p.m. The tricky part will not only be cooperation from the weather – the forecast is good – but a smooth Cup series race because Martinsville Speedway, the oldest in the premier series, doesn’t have lights. The doubleheader will be the first since a truck race washed out after 17 laps at Pocono in August 2011 was completed the following day, with the Sprint Cup race following. Mercedes driver Lewis Hamilton has taken pole position for the Malaysian Grand Prix in Sepang, Malaysia, after a wet qualifying session at the Sepang International Circuit. Tropical rains delayed the start of qualifying for 50 minutes. Hamilton made it back-to-back poles to start the new Formula One season. Red Bull’s Sebastian Vettel came close, but finished five hundredths of a second behind Hamilton and just in front of Mercedes’ Nico Rosberg, who was third.